After a brief delay while I waited on parts from my supplier, I’m finally set to finish up the GE LF-116 that I’ve been working on this month. It’s going to be returned to my office in playing shape very soon! 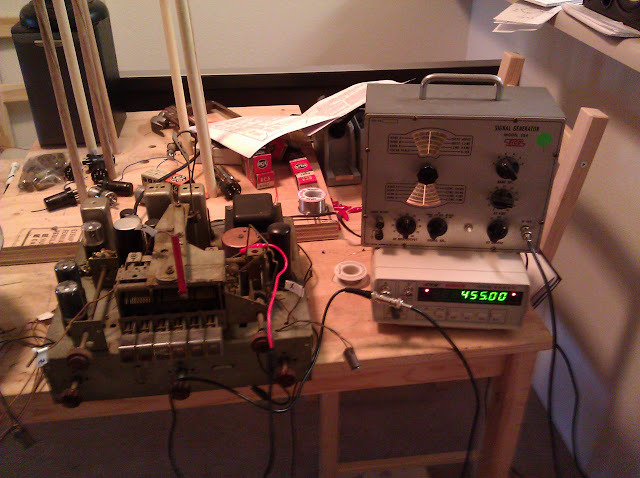 I powered up the radio for the first time with the power supply activated to get a feel for it, and played an MP3 through the line input. It played great – for about five minutes, until it heated up, then a nasty 60Hz hum took over. I’d let the set sit for a few minutes, then power it back on and it was fine for a minute or two before humming again. 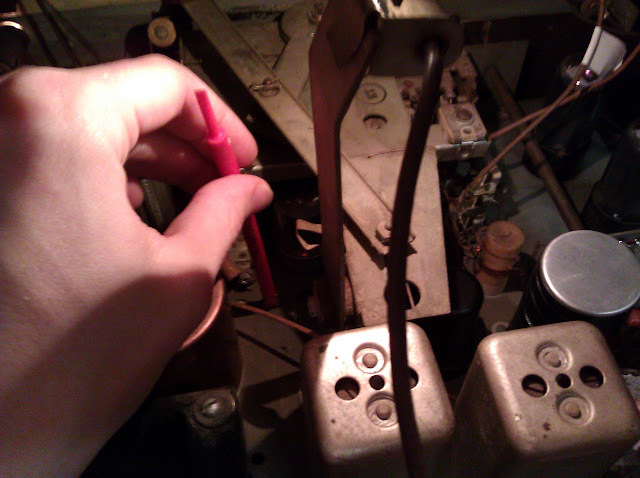 This was very clearly a thermal short, heater to a cathode. 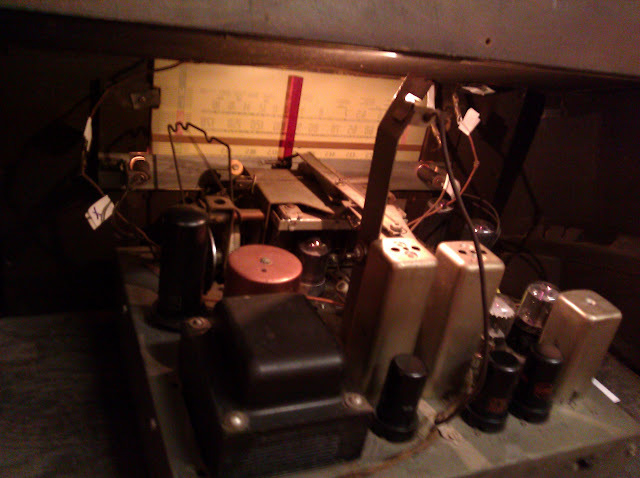 There are four tubes in the radio that are prone to H-K shorts: two 6SG7s and two 6SH7s. One of each tested totally dead, and the others were weak. 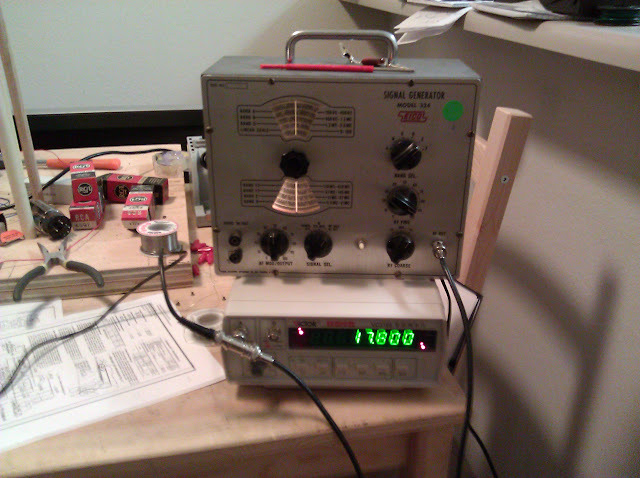 So was the 7Q7 oscillator. I ended up ordering a new set of NOS tubes for the RF stages, and installed them; the radio played perfectly at this point although not very well aligned. This step could be done outside of the cabinet, but the RF alignment required putting it back in and attaching the antennas. With the installation complete, I switch over to RF calibration, first with a 17.8MHz reference signal, then a 1500KHz, finally a 580KHz signal to align the Shortwave and AM bands. The trimmer locations were clearly called out on the service documents, so it was easy to find where to adjust even though it’s not the easiest to reach. It aligned up nicely! The dial tracks perfectly now. 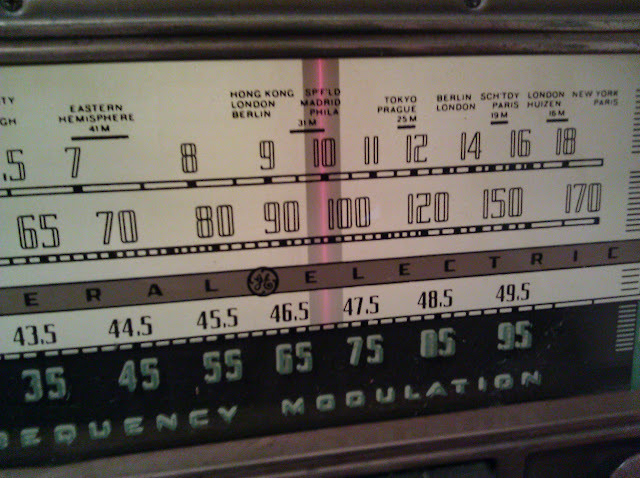 And speaking of the dial scale, it’s interesting – the tuned station is indicated by a thin line of red light surrounded by shadow. And that’s it! Back to the office it goes. I’m not planning to do much with the cabinet as it’s not that bad, and it’s going to be in a bit of a high-traffic location so if something happens to the finish I won’t have to worry about it. 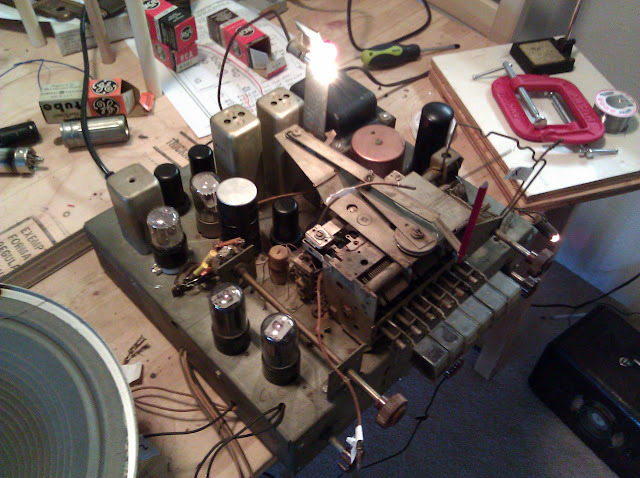 This entry was posted in Projects, Radios and Tubes, Vintage and tagged 455khz alignment, antique radio, GE, if alignment, LF-116, repair, restoration, rf alignment, tube radio. Bookmark the permalink. Thanks Dave! I wonder why that cabinet design is so rare…it does look a little “older”, more in the style of the earlier cabinets, while this one pictured here has the more iconic ’40s console look. Very good. I have the same, but other cabinet (rarer shorter burl cabinet). I haven’t gotten around to recapping but plan to…the amount of caps in tight places always makes me wonder why I choose to restore a console (but worth it in the end). So far I have done the cabinet. I love listening to it with it’s padded speaker chamber, but rotating the whole set due to the built in antennas is sort of crazy, plan on using an external. 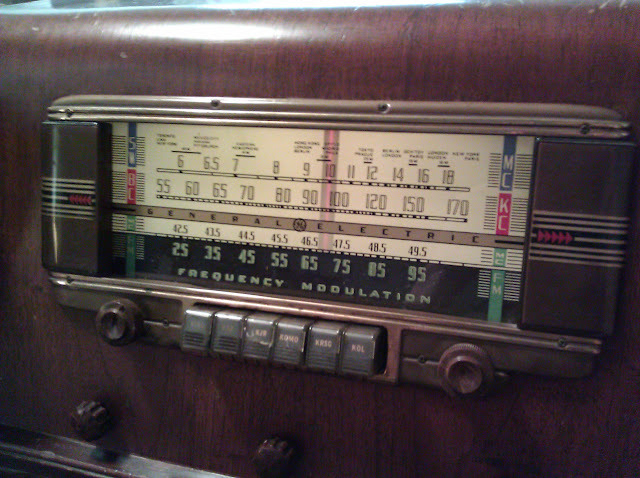 There’s certain models and brands that have a cool “dial” factor when you shut off the lights and listen at night…this is one of those radios, the rear-focused red line is just neat.